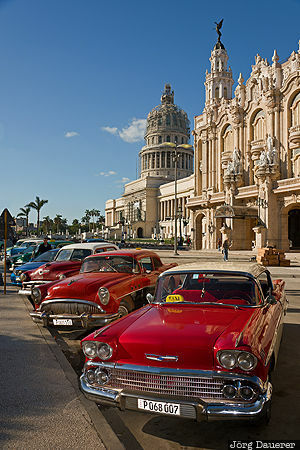 Typical red Classic Cars (which are used as taxis) in front of El Capitolio (or National Capitol Building) below a blue sky with some white clouds. Havana (or La Habana) is the capital of Cuba. This photo was taken in the morning of a sunny day in February of 2016. This photo was taken with a digital camera.